Sauerland Event won purse bids in Rome for EBU-EU middleweight champ Marcos Nader's mandatory defence against Italian Emanuele Blandamura, 21-0. Sauerland bid 29,414,00 Euro while OPI 2000 came in second best with an offer for 14,750,00 Euro. 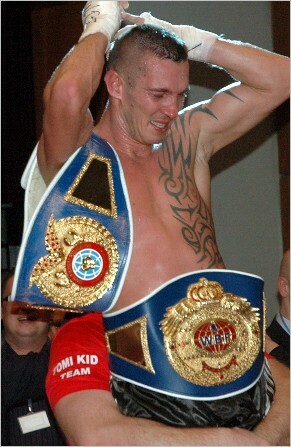 Nader, 18-0-1, won the title by outscoring Roberto Santos, whom he previously fought a draw with. When and were Nader vs Blandamura will go ahead is to be announced. It's busy days for Hungarian promoter, manager, agent and fighter Zoltan Petranyi, 49-20, who promotes and manages among others lightheavy Tamas Kovacs (pictured), who challenge WBA super lightheavy champ Beibut Shumenov December 14 in San Antonio. Zoltan will then defend the Hungarian heavyweight title and the UBO bauble against Tibor Balogh, 12-1-2, December 29 in Budapest. Petranyi do it all for that event: promote, matchmake and fight.